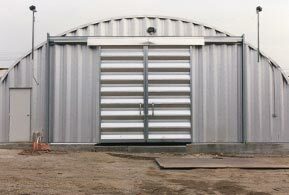 Metal garages for sale by Metal Building Kings®. 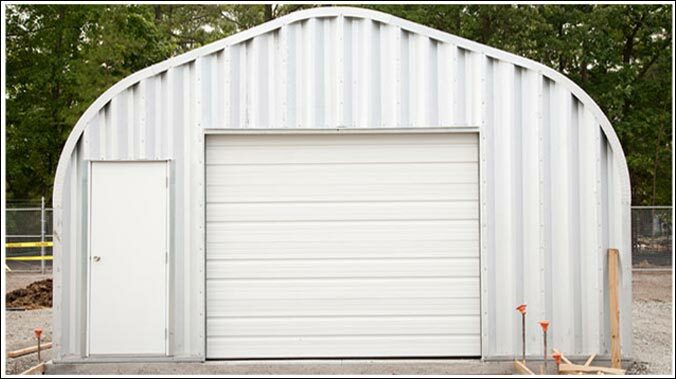 Metal garages are a permanent (and mobile) structure alternative to wood framed garages that require different stages of building code inspections, permitting and approval, and a wide array of building materials and expertise in constructing. For businesses and homeowners that want a secure long lasting maintenance free garage that requires less cost and effort in construction the metal garage is becoming more popular. Pre-engineered or prefabricated metal garages come ready to assemble and are designed to make it easy to manufacture and erect for the end user. The lower cost and added security and ability to withstand more severe weather is also a advantageous. Think of the metal garage as an steel erector set on a much larger scale. Almost anyone can erect a metal garage using a few pulleys and scaffolding in a matter of days. The only similarity to a wood garage is the cement foundation that is poured for the flooring. The best thing about a metal garage is that it can be size adjusted later on. Lets say for instance you want to add 6 more feet to the back end of the garage for expansion because you want to hold more contents inside and have outgrown the capacity of your existing garage. Well, all you have to do is order 3 more 2’ arches, unbolt and remove the back endwell and attached the new panels and replace the end wall and presto, you have a garage that is now 6’ larger than the original. Now that is truly an American way to build a garage. 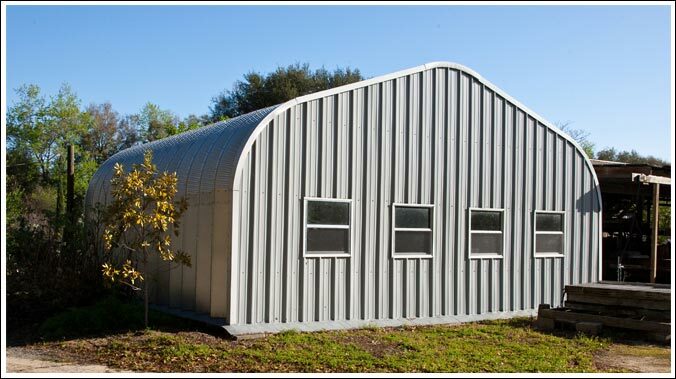 All metal garages by Metal Building Kings are made in the U.S.A. 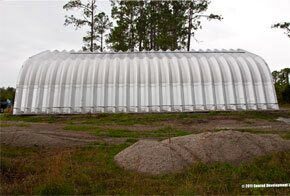 The most sturdy of the 4 metal garages is the quonset style pre-engineered arch system. 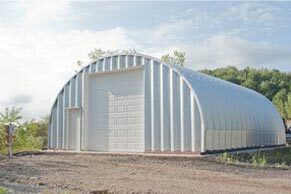 The arch metal garage system is comprised of steel arches that often come in 6 sections that are bolted together to form one arch that is 2’ in depth. So for a 20’ deep metal garage you would need 10 (6 section) arches. The garage panels are bolted down to the base plates installed into the foundation. 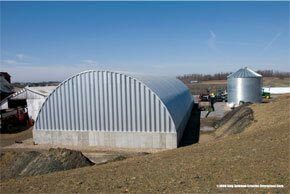 The metal is prefabricated on roll form machines forming 7.5” corrugated panels in various lengths depending on how high and wide the garage needs to be. 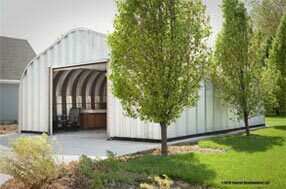 The metal used in Metal Building Kings® garages is 14-22 gauge 80,000ksi tensile yield carbon Galvalume steel coated with aluminum-zinc alloy and silicon. 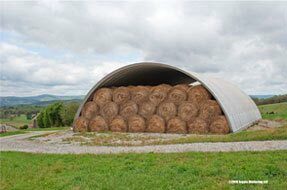 Each panel has ridges running width wise along the entire arch for added strength. The bolts and nuts are commercial Grade 8 and coated to last a lifetime with low density polyethylene washers already prefixed to guarantee a water-tight seal. 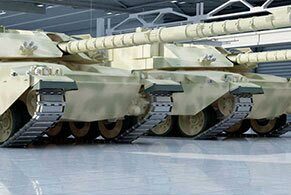 • The A Model - Peaked roof and slanted sidewalls. 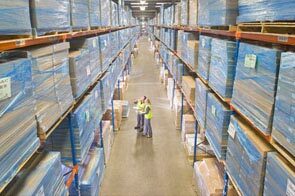 Commonly used for workshops, residential garage and equipment storage. 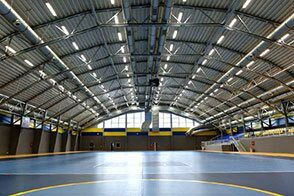 • The P Model (pictured above) - Peaked roof and straight sidewalls. Common for residential garages, workshops, and storage. • The Q Model - Semi-circle design Popularly used by farmers and the agriculture industry. • The S Model - Semi-circle design / Straight sidewalls. 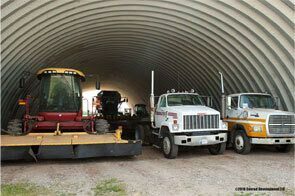 Often used for horse barns and trucking garages. Each garage has two endwalls that are made with the same material and assembled the same way that the top and sides are. The end walls are custom made with openings to install different door types for human and vehicle entry. Metal garages have superior door systems that are just about as equal in strength as the building itself with heavy gauge steel and hardware to secure the doors in place. Depending on what will be moving in and out of the garage there are different doors that are electronically operated or manually operated in different ways. • Turbine Vents - No power required and create a nice updraft moving air out of the garage. 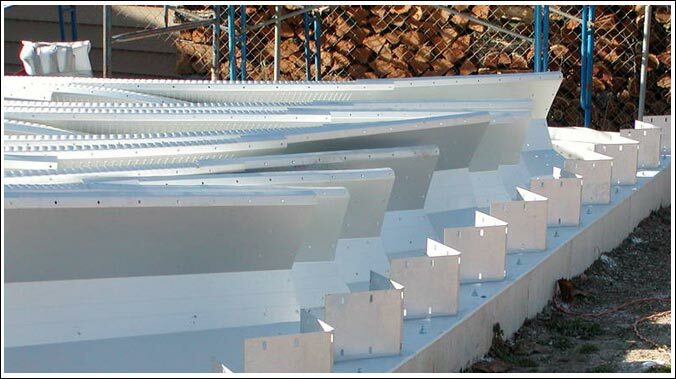 • Wall Louvers - Placed on the garage walls to let cross ventilation through the building. Another added benefit of a metal garage is the "clear span" design which allows you to use the entire interior space because it has no roof trusses, wall beams or plywood. In addition you don't have to worry about painting the garage because the paint is guaranteed to last 40 years. It is a high quality silicone-protected polyester coil coating system designed exclusively for the metal garages. Choose from several earthy colors to match your home or taste. And because the garage is made of Galvalume steel you never have to worry about pests nesting inside rafters, wood rot, mold, or termites. 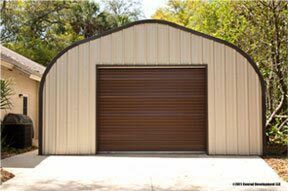 Prices for our metal garages are the least expensive among all wood and metal garages from start to finish including construction costs, materials, labor and delivery. Not only that but the arch system is the toughest and strongest among the several types you have to choose from. Live in Florida? Our metal garages can withstand 170 mph winds with the toughest certifications in the world. You can learn more about the price comparisons here. Often Metal Building Kings® has clearance sales where you can save thousands off our metal garages that are already discounted factory direct to you, the retail consumer. 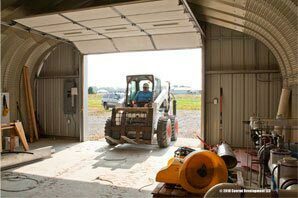 So when you consider building a garage on your property or if you own a business and need a building consider all the benefits of buying a metal garage. If you have any questions about our metal garage systems call us at 412-522-4797 or send us a message online by contacting us here. You can always design and price your garage with our metal garage price calculator. Add all the features, sizes, styles and colors and get an instant price or check out our clearance sales. Here are discounts on prices for each metal garage type that is commonly in stock at clearance sale prices.